Everpix, the cloud-based photo-sharing platform which debuted at TechCrunch Disrupt SF 2011, is now officially exiting its beta period with the debut of a revamped website, premium services, support for photo-sharing via email, and a long-awaited iPad application which now lets you see all your photos from desktop or the web in one attractive interface, among other things. But the most interesting changes for Everpix are taking place under-the-hood, and are not yet available in its consumer-facing applications. Everpix has developed unique technology to identify what your photos show – whether that’s a person, a nature scene, a photo of food, etc. 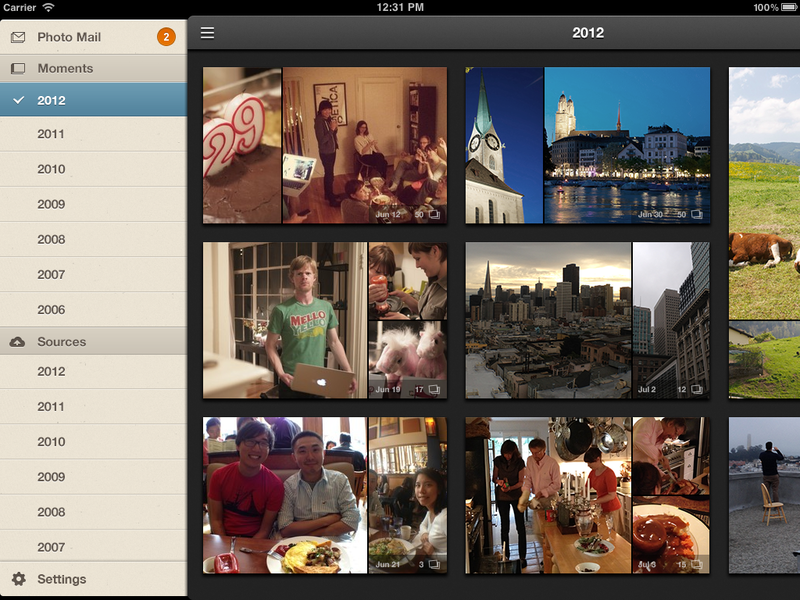 – which will soon allow you to query against your large photo collection in very specific ways. The company recently raised a $1 million seed round from Index Ventures, 500 Startups, Kii Capital, 2020 Ventures’ David Williams, and other angel investors in advance of the 1.0 launch, which brought its total raise to $1.8 million. The funding has helped the company continue to develop some of the new features rolling out now. The Everpix (Retina-ready!) website received an overhaul with a variety of improvements, which range from new animations for the photo galleries to the addition of new features like Photo Mail. This an option which addresses the troublesome problem of sharing multiple digital copies of photos which are stored either on the web in a service like Facebook, or locally on your iOS devices. In fact, Apple’s iPhone and iPad don’t allow users to send more than five photos per email, which has made sharing large photo selections a challenge in the past. 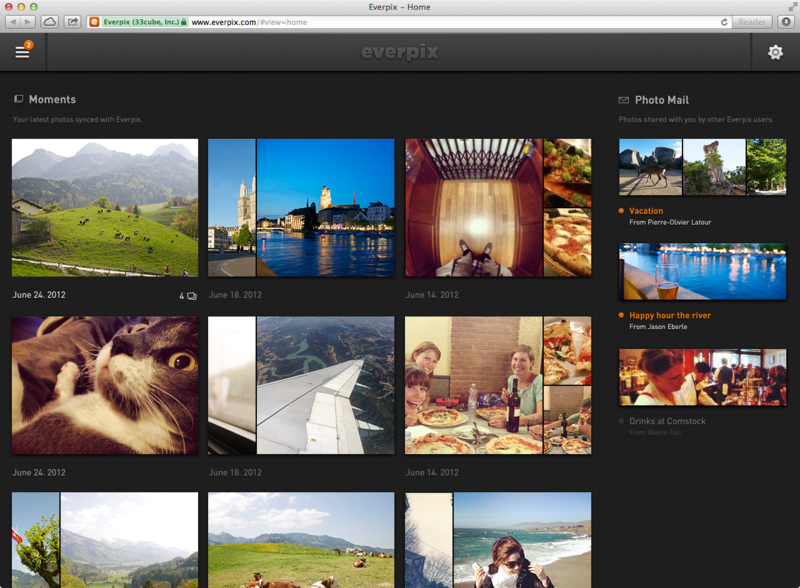 With Everpix, which aggregates photos sourced from iPhoto, Picasa, Facebook, Flickr, Instagram, email and elsewhere, users can now access all their photos from one service, and then selectively share as many as they want with others via email. Upon receipt, current Everpix users will see these photos appear in their own Everpix collections, and will have the option to download those items as a zip file. Non-Everpix users will simply see all the photos in the email itself, but won’t have the option to download without an account. However, Everpix will remember all the emails they’ve received, so even if they sign up later on, their accounts will contain the previous shares. Notably, the platform now supports full resolution photos, which makes its ability to send the digital copies via email worthwhile. Everpix co-founder Pierre-Olivier Latour says that one big advantage to this system is that the photo uploading process to Everpix’s cloud is “extremely fast” – even five times as fast as competitors in the photo-sharing space, he claims. So it’s not a huge hassle to upload high-res photos from desktop to web, in other words. Everpix now also supports SD cards as a photo source, and has added a new photo view simply called “Sources.” This is in addition to the automatically organized photo collections known as “Moments.” “Sources” is an option meant to ease the transition for new users, says Latour, as Everpix now shows you where your photos are from and respects the work you’ve already invested in creating things like Facebook or iPhoto albums, for example. But the eventual goal for Everpix is to become the default way people choose to view and share photos. One development which could help it get there is the image analysis technology the company has been developing in-house. As people’s photo collections grow exponentially over the years, it’s something that will become more valuable in time. Using generalized semantic tagging techniques, Everpix is building algorithms that can identify what the photo is of – meaning, whether it’s a person, a night or day shot, a wide or close shot, a city scene, a nature photo, a photo of a baby, or a vehicle, or a photo of food, among many other things. What’s important here is that the way they’ve built this to scale. After training the system on a minimal amount of photos, Everpix can then look for other photos in a user’s collection that match that signature without reprocessing the entire photo collection. This isn’t live yet in the user interface, but is in production under the hood. You can imagine how this technology would be helpful in the future to help you scour through massive numbers of photos. Something that’s actually somewhat difficult today if you don’t tag, organize, or title photos appropriately. Now a 1.0 release, Everpix is doing away with its free service and is charing $4.99/month or $40/year, with a one-month free trial (or 2 months for beta testers). This includes access to the website, iPhone, iPad and Mac application, with a Windows version still in development. Non-paying users will still be able to receive photos from others and view them in Everpix, but won’t be able to aggregate their own. You can grab the updated iOS app here in iTunes or sign up on the web.